During the booming crime wave of the 1930's the Federal Bureau of Investigation focuses it's growing power on taking down notorious gangsters including Baby Face Nelson, Pretty Boy Floyd and Public Enemy Number One John Dillinger. Dillinger, while playing a dangerous cat & mouse game with the Feds, lives his life in the moment, never straying away from spending money, riding his wave of popular public opinion and romancing one female he is particularly fond of. As Dillinger and his gang continue to evade J. Edgar Hoover's G-Men, the FBI takes new steps to ensure the capture of Public Enemy Number One dead or alive. "Public Enemies" is a lengthy film that suffers from an elaborate plot, bad pacing and ineffective action sequences combining for a very dull cinematic event. Unfortunately, due to all of the noticable problems, Michael Mann's "Public Enemies" is never able to completely submerse the viewer in the film and quickly becomes a forgetable movie. Johnny Depp and Christian Bale both provide chilling performances, however their portrayals are weighed down by the cubersome script that almost feels like it could have been two films. Michael Mann and Ronan Bennett's script is quite grandiose and suffers from just too much going on within the 140 minute running time. On one side, "Public Enemies" focuses on J. Edgar Hoover and the build up of the FBI. Christian Bale plays Melvin Purvis one of J. Edgar Hoover's top agents, one who was able to take down Pretty Boy Floyd and must now utilize new tactics to take down Dilligner. This side of the story felt like it could have easily been one film. Developing the FBI's growth within the U.S. and it's rise to successfuly capture John Dillinger. On the other side, the script focuses on John Dillinger. This portion of the script could have benefitted without having the FBI side of the story bogging it down. Mann tries to do justice with John Dillinger's legacy, but instead we get only bits that seem irrelevant in the grand scheme of the historical lesson. Unlike that last time Michael Mann told both sides of a cat & mouse game in Heat, here in "Public Enemies" the two stories become cumbersome and remain much like two magnets repelling eachother. Having two conflicting stories didn't help matters when it came to the pacing of "Public Enemies." Nearly every time the film seemed to settle into one of the two conflicting stories, abruptly the film would shift back to the opposite side. This made for an excruciating cinematic experience, one that never allowed for any meaningful impact to come from either side of the over-ambitious plot. 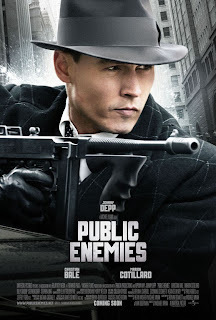 "Public Enemies" because of the over-ambitious plot, was not able to properly develop certain characters the film that it could have benefitted from. Dillinger's love affair with Billie Frechette (wonderfully played by Marion Cotillard) in particular, was a poignant aspect to the film, but Frechette's character only seemed glossed over by Mann. Frechette changes Dillinger completely and though Mann tries to display the infamous bank robber's affection, it is outshined by the over-indulgent story. In a film set during a major crime wave circa 1930's America, one would expect some gripping action sequences. Instead the audience is given nothing spectacular, or in the slightest bit thrilling. The gun battles that ensue between the FBI and Dillinger's gang are remarkably dull, furthermore the intricate prison break's throughout "Public Enemies" do not become even remotely engaging. In retrospect, the amount of subpar action was shockingly confusing when considering Mann's previous achievements in the genre. Here in "Public Enemies" however, the action sadly does nothing but fall flat on it's face. The performances throughout "Public Enemies" remains the best aspect to the film. Johnny Depp, Christian Bale and Marion Cotillard all three give stunning performances. Depp and Cotillard scenes together are very intriguing and perhaps the film could have worked better with more time spent on their relationship rather than the rise of the FBI. Christian Bale settles in nicely as Melvin Purvis, the man assigned to take down Dillinger at any cost. I did hope for more scenes between Bale and Depp, but the minimal time the two are on screen together is definately powerful. The rest of the cast also delivers noteworthy performances, but these performances becomed overshadowed by a heavy script and dull storytelling resulting in a disappointing film. I wanted to like "Public Enemies," it was a film that I thought could ingnite further gangster era flicks. I expected a triumph from Mann, who had previously seemed to nail the action genre with hits like Heat and Last of the Mohicans. What I got instead was a film that only made me want to watch The Untouchables again. "Public Enemies" definately deserves a watch, but it would be better served at home on DVD rather than at an over-priced megaplex.